Peaches aren't peaches unless they come from Georgia (the state; not the country.) That's the philosophy prevalent in the South of the United States this time of year.Unfortunately, Georgia peaches are delicate little fruits that won't take to international travel very well and you can't find them here in the UK. Instead, we've got these squashed little gems called doughnut or Saturn peaches that are super juicy and fragrant, and possibly Georgia peaches' best rival. I love peaches. Canned, stewed, raw, brûléed. In a plate, bowl or cup--it doesn't matter. I also love quick desserts and desserts in manageable-sized portions. There's only three people in my family (and if you've seen the tour of my kitchen, you know that our fridge is tiny!) and the last thing we need is a dessert that promises to feed eight. That's why there's only two portions of this one. 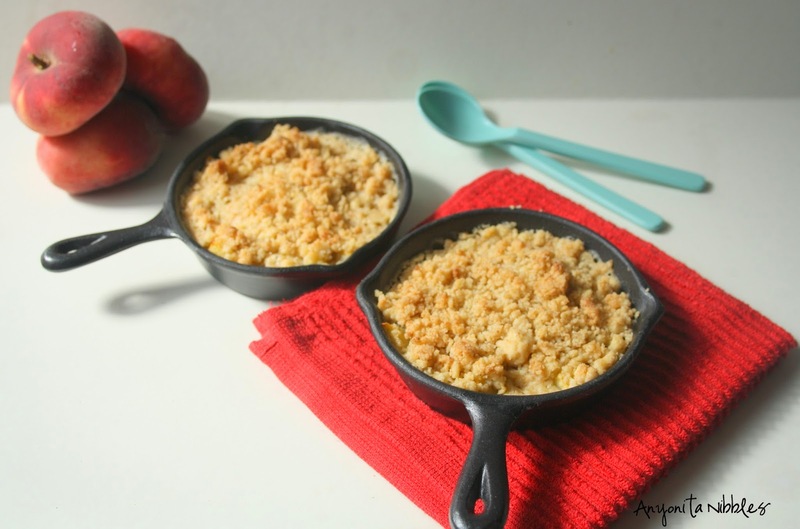 And since each crumble is made with a whole peach, it's one of your five a day, too! 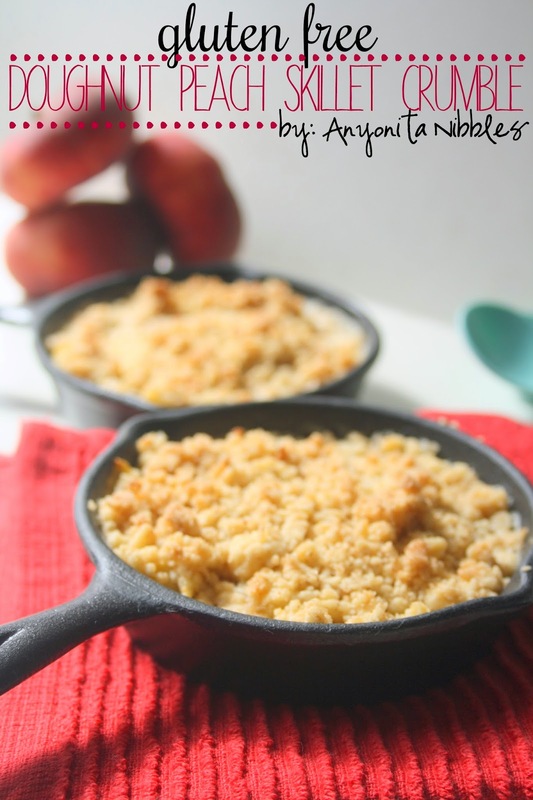 I deliberately left out the sugar in my crumble rub because the peaches were over the top sweet. If yours aren't as sweet as you'd like, feel free to add in a spoonful or two of sugar. Alternatively, you could crumble up a couple of Amaretti biscuits for added sweetness. 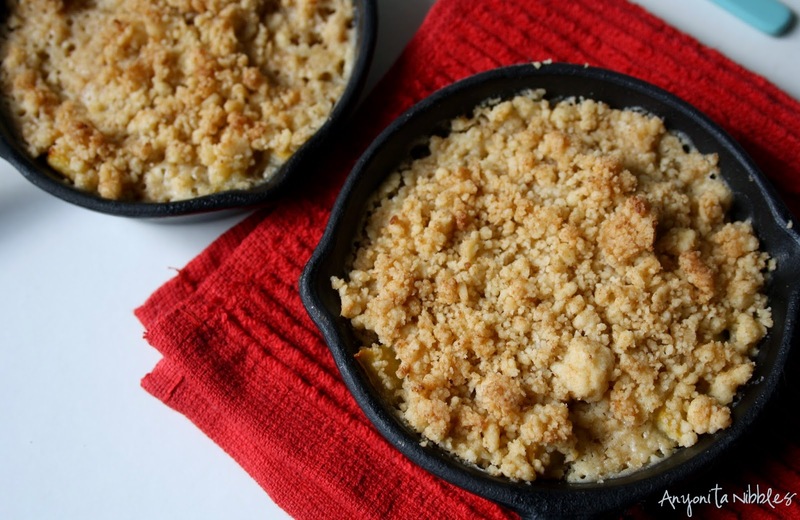 You can halve or increase this recipe simply by adding one peach per person and halving or increasing the ingredients for the crumble topping. 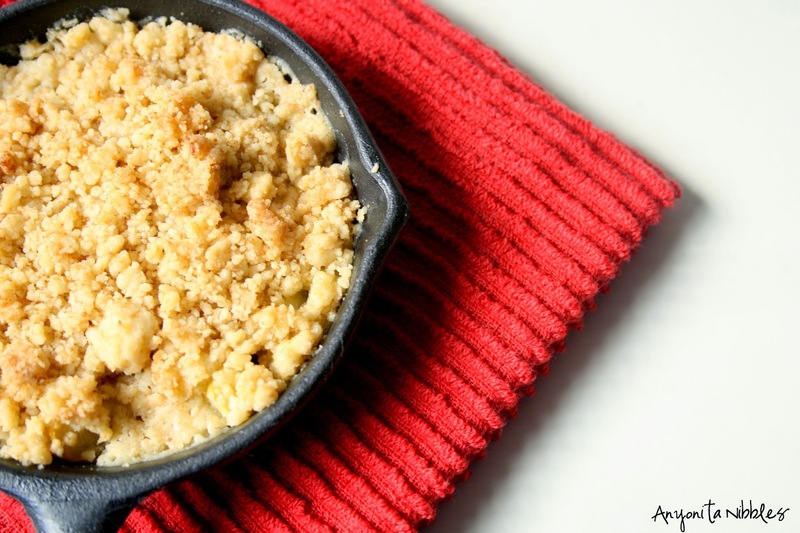 Rub the ground almonds and butter together using the pads of your fingers to form a crumble. If the mix is overly dry and won't keep its shape, drizzle in a bit of the cold water. Grease the inside of each skillet with a bit of butter. Dice the peaches, removing the skins if you prefer, and divide between the skillets. 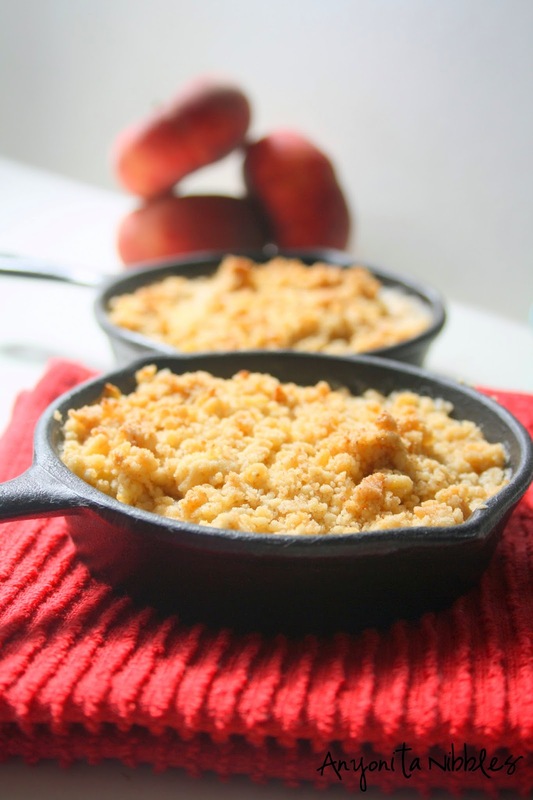 Top with the crumble and bake for about 10 minutes or until the crumble turns golden brown and the peaches are warm. That looks amazing and you know peach season is here in GA! I am going to pic some soon, wish I could mail you some! This is such a great idea--- I love the idea of teeny one or two serving desserts. There's just two of us and my husband tries to avoid sweets completely, so something like this would be wonderful when I'm craving just a little bit of a fruity dessert. I'm in NC so can get Georgia peaches this time of the year--- too bad they don't travel well; I could send you some! 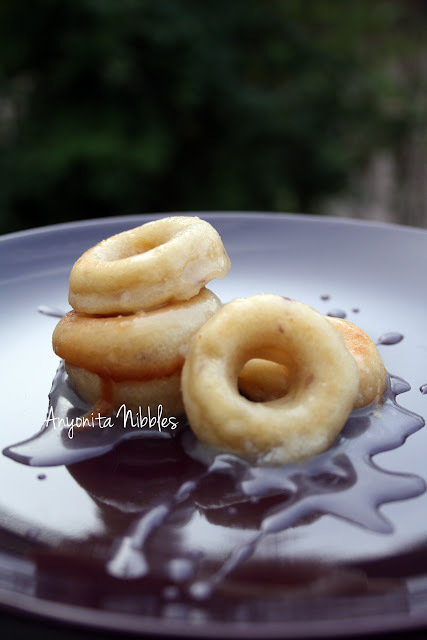 You had me at doughnut! 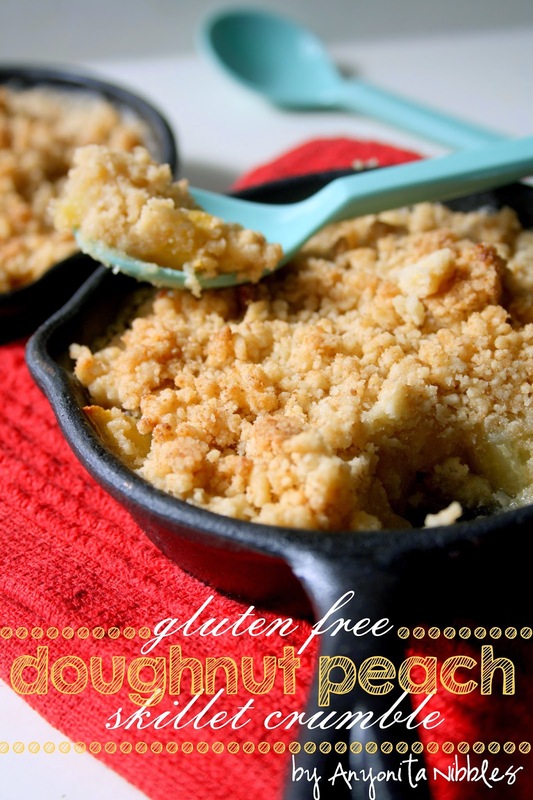 This Doughnut Peach Skillet looks amazing!! !